← Come and Enjoy My Food for a Good Cause! If your ever traveling to or through Duluth make sure you stop for breakfast At Sara’s Table Chester Creek Cafe. I just love farm to fork type eating establishments! This recipe is inspired by that cafe. Make Cranberry Wild Rice Bread – In the bowl of a stand mixer, whisk together the flours, yeast, and salt. Switch to the dough hook attachment, and add the water, molasses, and olive oil. Mix on low until a shaggy dough forms, then increase the speed to medium and knead until the dough is smooth and elastic, about 7-8 minutes. Turn the speed back to low, and add the cranberries and wild rice, and knead until evenly distributed throughout the dough. Transfer the dough to a lightly oiled glass or metal bowl, and tossed the dough around to coat the entire ball with oil. Cover with plastic wrap, and place in a warm place to rise for about 1 1/2 hours, until doubled in size. Line a baking sheet with parchment paper (if you are making rolls) or spray a loaf pan lightly with oil (if you are making a loaf). Lightly deflate the dough and either divide it into 12 pieces, shape into round rolls and place on baking sheet, or place the entire dough ball into the loaf pan. Cover with a oiled piece of plastic wrap and let rise again for about an hour. Meanwhile preheat your oven to 400F if you are baking rolls, 375 if you are baking a loaf. Brush the tops of the rolls or loaf with melted butter and bake until golden brown. The rolls will take about 20 minutes, the loaf will take about 45-50 minutes. Let loaf cool in pan for about 30 minutes then remove and let cool completely on wire rack. The rolls you can move directly to the wire rack to cool. Cinnamon Maple Syrup – Heat syrup and cinnamon sticks over low heat for 10 minutes. Remove and let steep for 1 hour. Remove all but one cinnamon stick and pour into canning jar. After cooling store in fridge till ready to serve. 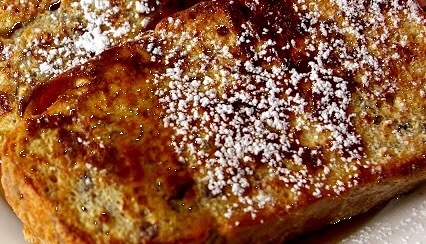 Make French Toast – Mix together the half and half, eggs, honey, and salt in a medium mixing bowl. Pour mixture into baking dish. Preheat oven to 375 degrees F. Line a baking sheet with a wire rack. Dip each piece of bread into the egg mixture and let soak for 30 seconds. Flip, and soak for another 30 seconds. Transfer each piece to the wire rack and let wit for 2 minutes before cooking. Melt one tablespoon of butter in a skillet of medium low heat. Place two slices of bread in the pan at a time, and cook 2-3 minutes on each side. Remove from pan and place on wire rack. Repeat with the rest of the bread, adding more butter to the pan as needed. Bake on wire rack for 5 minutes. Cinnamon Maple Syrup – Reheat Syrup. Serve hot topped with syrup and whipped cream or powdered sugar.